These are original designs created by Jim Kraft. The designs are not taken or used from a template. The next generation of websites being created are device dynamic—meaning the content adusts to the size of the screen. 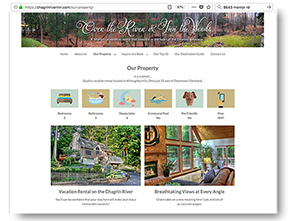 Over the River and Through the Woods is a vacation rental that has is competing against traditional hotel stays. Even though rental is first class, it still needs to be found and seen. The strategy is heavy organic search build based on local destinations. The theme "Turn your stay into a Vacation" will do well do meet the owner's objectives. The site has a powerful reservation tool that syncs with other reservation engines. How does LED perform in comparison to fluorescent when it comes to color matching? What about cost vs the long life of LED? Is my energy company offering eiquipment rebates? These and other questions will be addressed on the new www.crslightled.com website currently being built. This ecomm site sells real maple syrup and maple products across the U.S. The site was built to receive organic hits via search engines. A high quality product presentation helps with credibility. Maple Valley Sugarbush was selected to be the excusive maple syrup provider for Hale Farms in Bath Ohio. Recent upgrades include: tripled maple syrup production facility, new equipment, and a significant increase in sap taps. 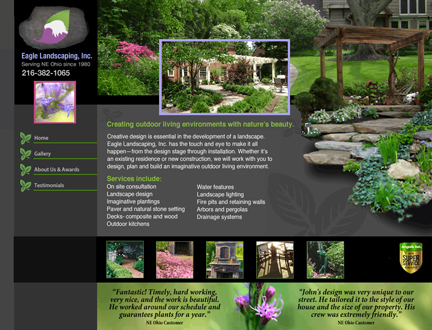 Eagle Landscaping needed to have their portfolio of creative landscape design projects online for quick reference. The site has a thumbnail library that points to large and beautiful landscape photos. This site was used to help lauch a new flagpole prooduct line. This multi-color line is great for tying into team or theme colors. All products are USA made. 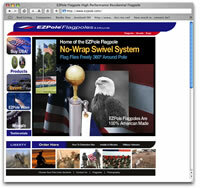 The site elements have morphed into a parent site...EZPOLE Flagpoles. 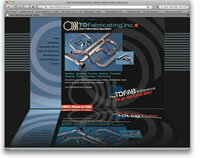 This is the 2nd site Kraftworks designed for T&D. Some of the growth T&D has experienced includes; a recent building expansion, a 20,000 square feet expansion, and recently purchased a competitors operation. T&D is growing even though NE Ohio metal working companies are under tough fire with foreign competition. This site has a pass around value which creates product interest. The site continually brings in new business with Ivy league and private schools, pharmaceutical companies, dentists, distributors, studios, and many small businesses who have the need to manage their light. This business is on and running with well over 500 clients. 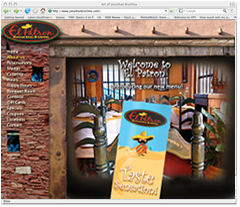 El Patrons Restaurant came to Kraftworks looking for a new menu design and restaurant theme. The new menu design has been recieved well and they are incorpating it in their other restaurants. The website homepage has just been completed. The rest of the linking and pages are coming soon. The graphics go a long way in helping with branding and setting a positive tone/feelings for ElPatron. Maple Valley Sugar Bush is a twelve year old farm that has set a goal of 100 CSA (Community Supported Agriculture) clients for 2010 and have their syrup product line available for purchase. They have asked us to help them achieve this goal through consulting, web and design work. The sugarbush division is moving ahead full force in maple syrup production. 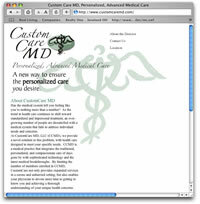 Custom Care MD is a Personalized, Advanced Medicare Care practice. The Director needed to be up on-line and on very fast with a message of quality and credibility to seize a window of opportunity that doesn't come around to often. Jim's experience was invaluable in getting to the correct message with an award winning presense..fast. This site is offline as it was intended to be a temporary solutiion. Dr. Richard Tomm used Kraftworks to get a new laser treatment center up and running in South Euclid, Ohio. The contribution in name awareness and branding was very helpful in their marketing communication efforts. This site is offline due to defective laser equipment. This site was used to intoduce a brand new product line. It was used for five years with very few updates. It helped get the line into many distribution outlets across the US. Features include Flash rollover animation, and e-commerce. 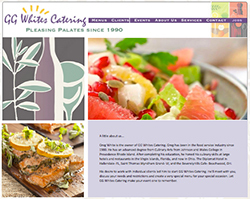 Greg White asked Jim to design the GG Whites Catering website. Greg wanted it simple and straight forward, not incredably fancy. Jim presented just that and the new site is already helping Greg to generate new business and to communicate to existing clients his complete menu and services offered. Thermovation is a leader in combination process heating. This site contains 52 pages of engineering friendly information, many photos of actual jobs, and they offer a book and video which the site provides an avenue to distribute these. This company was acquired by Litzler. M&CT is a leader in the Dip Molding process. They have developed systems for many major corporations. With just few minutes at this site, the viewer would have a well rounded view of the companies capabilities. This company was acquired by Litzler as well. 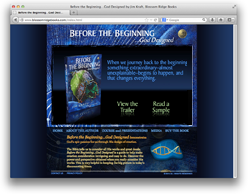 This site served the client well in many areas. It communicated other services to existing clients, raised awareness to potential clients and as an in-house communication tool, it freed up personnel to service clients. This site is offline due to business aquisition. Eagle Ridge Productions is a spec business model in development and is currently offline.